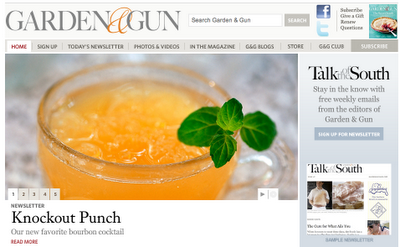 I've been introduced to a new magazine - Garden & Gun. It's a Southern Lifestyle publication out of Atlanta that covers all things South of the Mason Dixon. After thumbing through the June issue and reading up on their website, I've decided I really really like this magazine. Because like many of their readers, I'm a Southerner living no where near the South. Every time I visit friends and family down South, they ask me when I’m coming home. What I’ve come to realize is that I am home—in a way, at least. There are Derby parties in the spring, pig roasts in the summer, football tailgates in the fall, and farmers selling country hams, dirt-dusted collards, and fresh black-eyed peas from roadside stalls on New Year’s Eve. Maybe it’s the thrill of having all of these distinctly Southern moments out of context, but I’ve never felt a greater sense of belonging. Of course there are still tall buildings and jackhammers and densely packed streets, but the South is flourishing as much in Manhattan as it is in Memphis or Mobile. Which means transplants like me feel comfortable here in a way Willie Morris never could—no matter how long we intend to stay.